I might as well park it out front: to most people, the name DeLorean will forever be linked to time travel- specifically to the car modified for that purpose by ‘Doc’ Brown in the Back to the Future films (1985–1990). 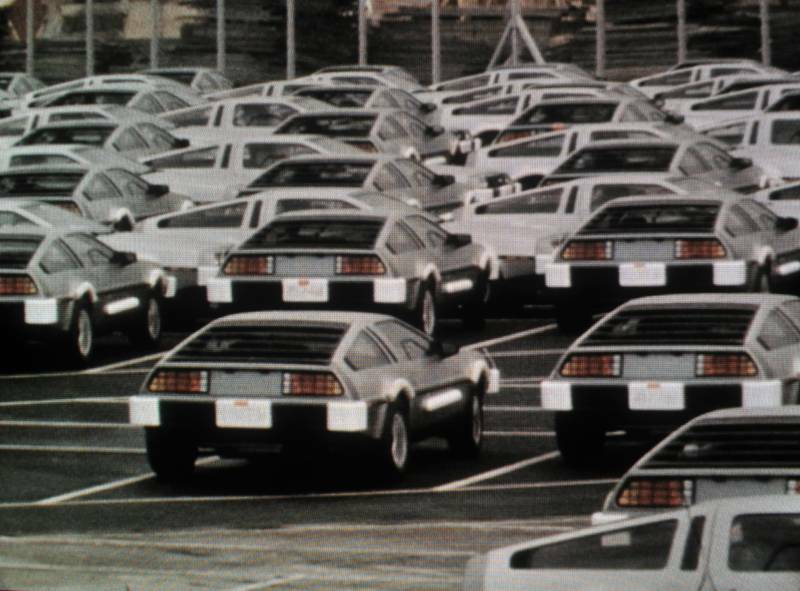 In Duncan Campbell’s film Make It New John (2009), we travel back to the late 1970s, when flamboyant American motor industry supremo John DeLorean elected to manufacture his new company’s only car – the DMC-12 — in West Belfast. The film effectively plays out in three acts. The first of these sketches a social and political context for the development of DeLorean Motor Company: black-and-white footage seemingly borrowed from a 1950s feature film shows a bored boy, perhaps representing the young John DeLorean, in his suburban home. As we shift to colour advertising footage, laughing young people surf and toss Frisbees, while a Beach Boys-pastiche soundtrack extols the virtues of the Pontiac GTO. Images of gas-station signs then give way to maps of the Gulf and soldiers languishing in the desert, in clips that Campbell must have taken from news sources. Those familiar with Campbell’s work will also be familiar with his method of collaging diverse archival material to construct narratives riddled with doubt and ambiguity. For much of the middle section of this film, his touch is relatively light: we might almost be watching a 1980s documentary about the establishment and subsequent collapse of the DeLorean company. Initially backed by a Labour government hopeful of integrating a Protestant and Catholic workforce, DeLorean was abandoned by Margaret Thatcher’s government, which refused to bail out the failing company. Make It New John repeatedly describes impossible aspirations and frustrated expectations. The car’s low-slung, brushed stainless steel body and iconic gull-wing doors, for instance, promised effortless speed and elegance to “horny bachelors” (as one character says in the film). In fact, the car was reportedly very heavy and handled like a pig. As Make It New John progresses, DeLorean increasingly looks like a man tired of lying about the health of his company. When, in the final passage of the film, we realise that the five workers being interviewed are in fact actors shot on specially graded 16mm film, the shift at first seems incongruous, even misguidedly deceptive. But we have been watching lies, or fictions, from the start. The visiting British dignitaries, the American salesmen boasting about the car’s popularity and the aggrieved workers leaving the factory: all are performing for the camera, with varying degrees of innocence or mendacity. As the film winds to a close, the interviewees gradually excuse themselves, until just one remains, shifting awkwardly in his seat. His name is John. The female interviewer clumsily elicits a confession of loneliness, and the story of the sweetheart who changed her mind, though “that was all many years ago”. Clichés of narrative and class representation begin to creak at the sides. Campbell’s film ends as a tale of two Johns, each equally implausible, and each ultimately failing to ‘make it new’.